When you need to turn a series of challenges into a full level in your Gamestar Mechanic game, the most direct way is from the bottom up. The bottom-up process involves building a game as a series of small pieces and linking them together to produce the final creation. This simple and efficient approach to designing a game is important for beginners and helpful for veterans. Come up with some small challenges. Compose a gauntlet of enemies, a little puzzle, a door that requires two keys to enter, or whatever else you want to add to your game. Incorporate one or more challenges into a level. You might place the challenges in a line, a branching system, or another type of path that leads the player through your challenges and toward the goal. Try to make challenges intersect, if you want. Build passageways to connect challenges, and add more challenges to unused space. You can use this intuitive approach to make any game: Design each level obstacle by obstacle and goal by goal. Using the bottom-up method, you can try new approaches and build basic games in a series of challenges; however, this method is commonly and effectively used for building large, complex games. Consider this game, which was designed with this approach in mind. 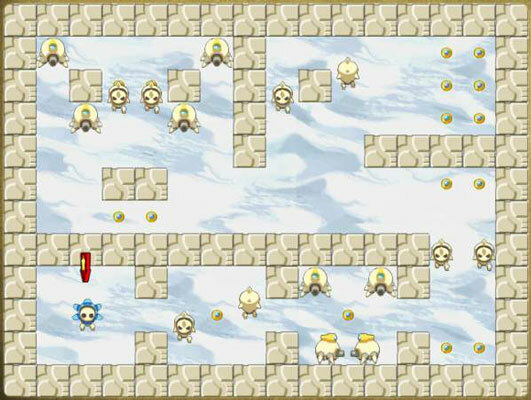 The level is divided into multiple segments of separate challenges: The avatar passes through two small cells, navigates across a hallway, and makes its way up to a group of two rooms that can be completed in any order. Games of this sort can be designed easily from the bottom up: The designer creates the cells at the bottom of the level first and then allocates the remaining space to the remaining hallways and rooms. This technique doesn’t require you to think about the whole level at one time (just the part you’re working on), though it can lead to interesting results.